On October 20th, Andrew Wilder of United States Institute of Peace and Marvin Weinbaum of the Middle East Institute discussed the current situation in Afghanistan and what issues Congress should focus on during the upcoming change in administrations. Ken Katzman senior analyst at the Congressional Research Services moderated the discussion. This event was the second in a three-part series on foreign policy during this political transition. The first event focused on Colombia , and the next event will focus on Iraq. Andrew Wilder is the vice president of Asia programs. He joined USIP in August 2010 as the director of Afghanistan and Pakistan Programs. Prior to joining the Institute, he served as research director for politics and policy at the Feinstein International Center at Tufts University. Previously, Wilder served as founder and director of Afghanistan’s first independent policy research institution, the Kabul-based Afghanistan Research and Evaluation Unit (AREU). This was preceded by more than 10 years managing humanitarian and development programs in Pakistan and Afghanistan, including with Save the Children, International Rescue Committee, and Mercy Corps International. Dr. Weinbaum is professor emeritus of political science at the University of Illinois at Urbana-Champaign, and served as analyst for Pakistan and Afghanistan in the U.S. Department of State’s Bureau of Intelligence and Research from 1999 to 2003. He is currently a scholar-in-residence and Director of the Pakistan Center at the Middle East Institute in Washington DC. Professor Weinbaum has his doctorate from Columbia University in 1965, his MA from the University of Michigan in 1958, and his BA from Brooklyn College in 1957. In 1965 he joined the faculty of the University of Illinois at Urbana-Champaign. At Illinois, Dr. Weinbaum served for fifteen years as the director of the Program in South Asian and Middle Eastern Studies. Dr. Katzman serves as a senior Middle East analyst for the U.S. Congress, with special emphasis on Iran, Iraq, Afghanistan, the Persian Gulf states, and terrorist groups operating in the Middle East and South Asia. He provides reports and briefings to Members of Congress and their staffs on U.S. policy on these countries and issues, and provides analysis of related legislative proposals. He has participated in several congressional delegations to the region at the Member and staff level, and given many official presentations and briefings at conferences and meetings throughout Europe, Asia, and the Islamic world. 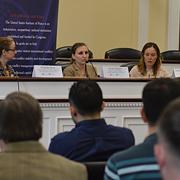 This was the 34th event in the USIP/PSA Congressional Briefing Series – Topics on International Conflict Resolution and Prevention, an educational program designed to provide congressional staff with opportunities to engage leading experts and fellow Capitol Hill staffers in bipartisan forums. The program aims to build cross-party relationships, encourage bipartisan dialogue, and equip staff with new perspectives on critical issues in international conflict, resolution and prevention.